Stress placed on coronary arteries as a result of normal cardiac function is an expected part of the aging process. This stress can lead to disruptions in arterial function, inflammation, proliferation of vascular smooth muscle, decreases in circulating nitric oxide (NO) levels, and eventually vasocontraction of key coronary arteries. CitraNOX provides a blend of targeted nutrients designed to help dampen this stress placed on endothelial cells. Using a combination of high-dose L-citrulline, quercetin and grape seed extract, CitraNOX delivers full-spectrum support to help support inflammatory balance, arterial elasticity, optimal nitric oxide levels, and blood flow. 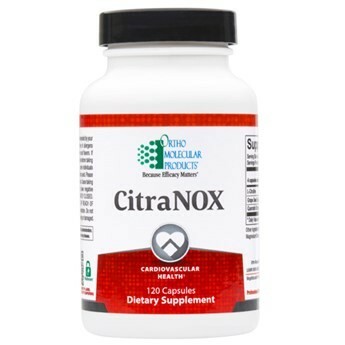 CitraNOX provides a powerful formula for those seeking to optimize several mechanisms of cardiovascular health.